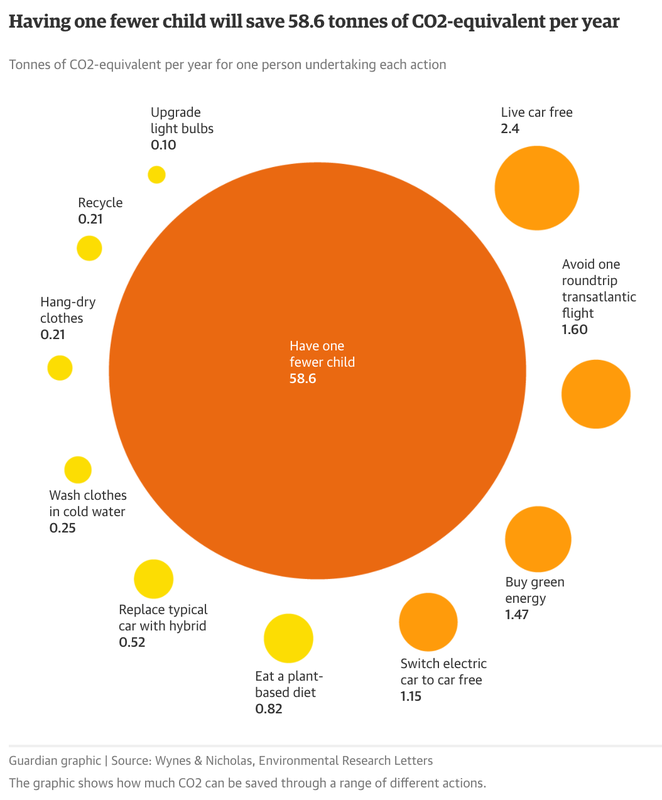 You care about climate change, so should you have fewer children? Here's an article in the Guardian that argues for this, and the accompanying graphic. The pitch here is to the individual. Like you might decide to recycle or wash in cold water or eat less meat, in response to climate change, the idea is that you should decide to have a smaller family, in response to climate change. I find this way too simplistic, for many reasons. Many of the circles on the graphic have no downside. It's all good, if people recycle. However, it would be problematic if a lot of people had fewer children. If you had one child instead of two, and so did a lot of people for the foreseeable future, that one child would be facing a very troubled future. She would be more burdened with responsibility for older members of society than we are at the present, and as she aged, she would suffer from there not being enough people to meet her needs. If the population decrease were dramatic, it could easily be true that her future would be far more marred by the population decrease than by climate change. It's notable that in countries (like Japan) where there is concern about climate change, but also a shrinking population, the shrinking population is seen as a curse, not a blessing. Let's dig a little deeper. It's interesting what's on the graphic and what isn't. You can certainly suggest to people that they buy hybrid cars and wash their clothes in cold water, but certain things are beyond the pale. There's no circle for ending your life at age 40. But that circle would be huge (about half as big as the one-less-child circle). There's no circle for refusing medical care after the age of 70, even though that tends to involve a lot of energy and resources. That would also be a big circle. Some sacrifices can't be expected--they're of a different order altogether. Sacrificing a second child is that sort of sacrifice for many of us. Why? My new book explores this in the first several chapters. Even without a long further story, you can see the graphic is odd. It's not clear skipping child number two should be on the graphic, side by side with changing lightbulbs and washing in cold water. Bottom line: I don't think any individual should think "I must have fewer children, because of climate change," especially if they live in a society where procreation is already at the replacement rate. Climate change is a problem but population shrinkage is also a problem, so it's not at all clear that one is the best solution to the other. But if you do live in a society with a growing population, it's another story. In that case, there may be ways for change to take place without individualistic moralizing. Such a society shouldn't valorize huge families and shouldn't stigmatize people who have no children or very small families. In ballooning societies, it's all to the good, environmentally, if people don't think of having a family as their primary vocation. I'm just not convinced that it's either convincing or reasonable to say, even to those people, "you should wash in cold water, recycle, and skip your longed for second child." I think that any problems associated with population shrinkage are relatively trivial compared to that of climate change (and to other environmental issues as well). And of course there's no lack of (desperately) willing immigrants to fill the service needs of an ageing wealthy population.